View a talk Sustainable Gardening in a Changing Climate that David Wolfe, Professor, Department of Horticulture and Faculty Fellow, Atkinson Center for a Sustainable Future gave to the Ithaca Garden Club on November 20, 2013. 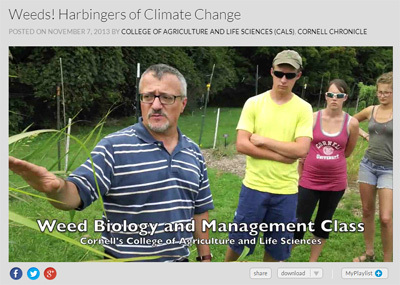 For more info, visit the Cornell Climate Change website. Permaculture systems meet humans needs while restoring ecosystem health. Registration is now open for the online course Permaculture Design: Fundamentals of Ecological Design, offered Jan. 6 to Feb. 20, 2014 through the Department of Horticulture’s distance learning program. The study of permaculture helps gardeners, landowners, and farmers combine a knowledge of ecology combined with its application to supporting healthy soil, water conservation, and biodiversity. Permaculture systems meet humans needs while restoring ecosystem health. Common practices include no-till gardening, rainwater catchment, forest gardening, and agroforestry. The course provides an opportunity for you to build your knowledge about permaculture and ecological design. 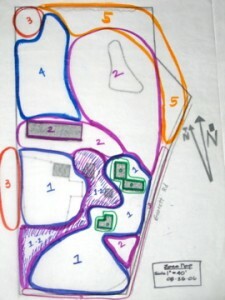 Participants will explore the content through videos, readings, and activities and complete portions of a design for a site of their choosing. View the full syllabus for the course and find registration information at the course website. The instructor, Steve Gabriel, is an ecologist, extension educator, and forest farmer living and working in the Finger Lakes Region of central New York. He currently spends his time working for the Department of Horticulture’s Garden-Based Learning program and coordinating the Northeast Mushroom Growers Network. 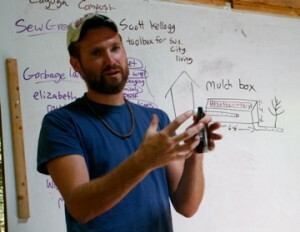 He also teaches for the Finger Lakes Permaculture Institute and serves on the Board of Directors for the Permaculture Institute of the Northeast. He is currently co-authoring a book on forest farming with Cornell professor Ken Mudge, which is expected to be published in 2014. Completion of a single class gives students a certificate of completion from the Department of Horticulture and continuing education credits. Completion of all three courses gives students the portfolio necessary to apply for an internationally recognized certification in Permaculture Design though the Finger Lakes Permaculture Institute. The fee for each class is $600, and registration opens about six weeks before courses begin. If you missed Lindsay Jordan‘s seminar on Monday, Using under-vine cover crops as a sustainable alternative to herbicide in cool climate Riesling Vineyards, it’s available online. ITHACA, N.Y. – Farmers, gardeners and students have a new place to learn about climate change and how to be part of the solution. The website, climatechange.cornell.edu, is a one-stop shop for everything climate change says David Wolfe, faculty fellow at Cornell University’s Atkinson Center for a Sustainable Future and chair of the center’s Climate Change Task Force. At the core of the site is a searchable directory of climate change research and outreach programs at Cornell with summaries, contact information, and links to more information. 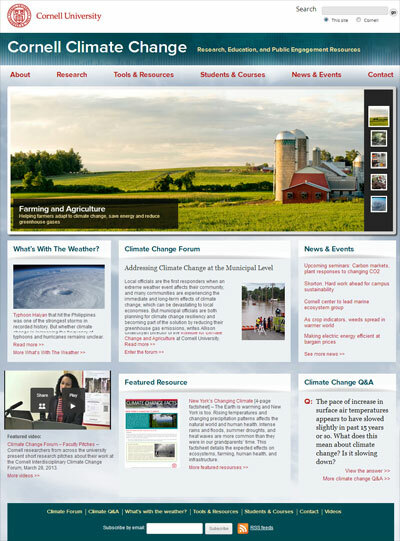 In addition, issue-specific pages to help farmers, local government officials, youth educators, and others connect with Cornell’s research-based resources and tools for reliable information. “Our ultimate goal is to explain the science of climate change so that everyone can understand how it affects their lives, and can start to make changes,” commented Allison Chatrchyan, director of Cornell’s new Institute for Climate Change and Agriculture. A Climate Change Forum column, where Cornell experts explain their research for the public or a current issue in the news. Climate Change Q&A, where visitors can ask a Cornell expert to answer a burning question. Every fall, students in Restoration Ecology (HORT 4400) take on a pro bono consulting project for a local non-profit agency, working together to gather data, analyze the issues and report their findings. 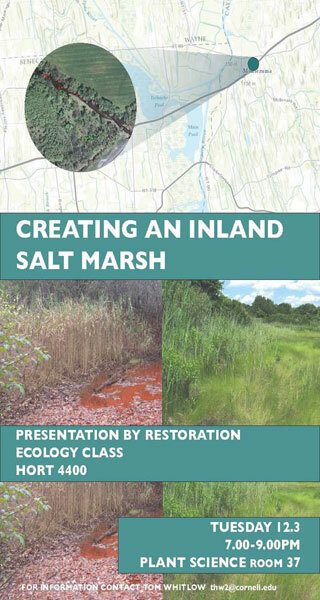 This year, the class has been studying a salt spring near Montezuma, N.Y., with the intent of developing strategies for using the saline water to create an inland salt marsh. This is a rare vegetation type in the Northeast, so it is interesting in its own right as well as posing challenges for restoration because there is virtually no precedent for this type of project. The students will report their findings on Tuesday, December 3, 7 to 9 p.m. in 37 Plant Science. If you missed Monday’s seminar, Up, down, and broken: models of transport processes in xylem and phloem featuring Abraham Stroock, Associate Professor, School of Chemical and Biological Engineering, Cornell University, it’s available online. 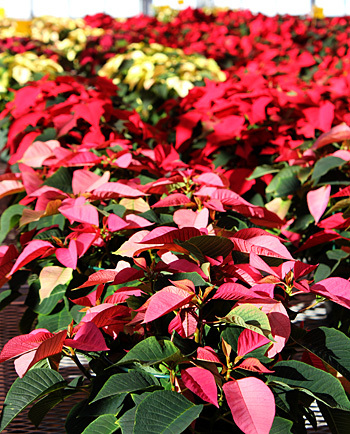 Hortus Forum poinsettia sale: Pre-order now! Poinsettias soak up the sun at the Ken Post Lab greenhouses. Hortus Forum, Cornell’s undergraduate horticulture club, is now taking pre-orders online for poinsettias for pick-up at Ken Post Greenhouses December 9 or 13, or on-campus delivery. Four different varieties are available (see image below) in 6- or 8-inch pots or mixed basket arrangements. Supplies are limited, so order early. Questions? Contact the club’s vice president David Harris: dch92@cornell.edu or 607-379-8809. 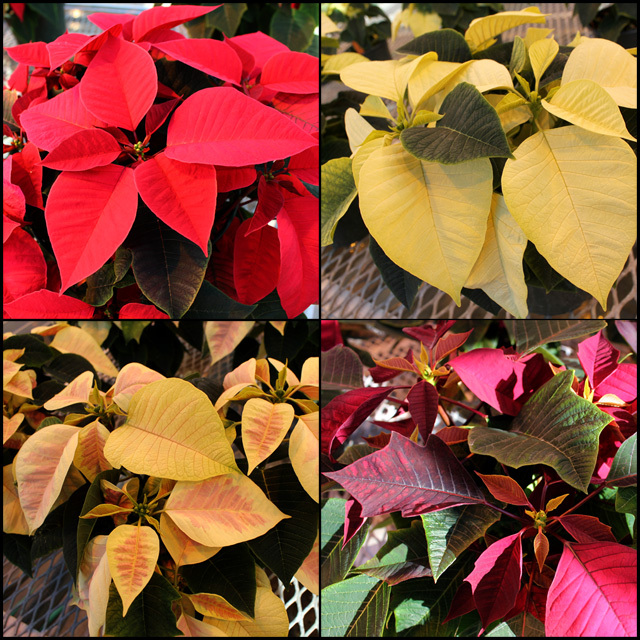 Below: This year’s poinsettia varieties (clockwise from upper left): red, white, burgundy/speckled, white/pink variegated. Click image for a larger view. If you missed Monday’s seminar, Lessons from 40 years of fruit research, featuring Alan Lakso, it’s available online. Skorton: Hard work ahead for campus sustainability [Cornell Chronicle 2013-11-7] – Among the winners of the Cornell University Partners in Sustainability Award: The Cornell Permaculture Club, a student group that produced a demonstration permaculture garden next to the Trillium dining facility, where the fruits, vegetables and herbs grown are given directly to chefs for Trillium meals. 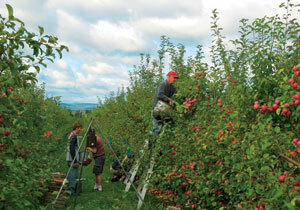 TSF funding helped support an earlier project comparing organic and integrated fruit production systems at Cornell Orchards. For more than a decade, CALS has bolstered its sustainability research with a steady stream of gifts from the Toward Sustainability Foundation (TSF), a Massachusetts-based organization founded by an anonymous, eco-minded Cornell alumna. In its first 10 years, TSF provided nearly $550,000 in funding for approximately 75 faculty and student projects that examine the technological, social, political, and economic elements of sustainable agriculture. The deadline for proposals for 2014 funds (up to $12,000 per grant) is December 9, 2013. Projects that involve Cornell undergraduate or graduate students in major roles. Projects that investigate organics and sustainability relating to urban/peri-urban horticulture and agriculture. Projects that involve county or region-based CCE educators and horticulture enterprises. Projects that investigate key ecological processes and environmental impacts of organic and alternative farms, food systems, or managed landscapes. Projects that promote soil and water resource conservation, human and wildlife habitat, and other ecosystem services in farms, gardens, natural areas, and managed landscapes. Projects which extend professional development and/or educator enrichment through well-planned multiplier approaches. Find more information and application procedures at the Department of Horticulture’s TSF webpage.